As with all claims based on statistics, there is some dispute about this. Jeremy Reimer's graphs put into perspective the Commodore 64's third place. In the period 1982-1984 the C64 outsold the IBM PC and it continued to outsell the Mac for the rest of the 1980s. It is only because the Mac has gone on that it is in second place and the IBM PC and its clones - and that is overwhelmingly its clones - really do dominate the scene since 1985. But the C64 is perhaps a digression. It achieved its sales with a single model over 22 years. The Raspberry Pi has had 8 models but it is only 5 years since the first was launched and more than 12.5 million units is definitely something to celebrate. it is so low cost that it introduces an era of almost disposable computing and lowers the financial barrier to using advanced computing devices to do all sorts of creative and useful things. The book is a practical introduction to using all recent models of the Pi, i.e the Pi 2, 3 and 0 to connect real world devices. The Pi's potential for the ever-expanding IoT (Internet of Things) is already well demonstrated and gives it an assured future. 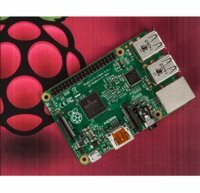 In future years will we see sales of Raspberry Pi exceed those of the PC and Mac combined?